Liz Woolery is Deputy Director of the Free Expression Project at the Center for Democracy and Technology, where her work focuses on the intersection of free expression and the digital world. Prior to CDT, she was with New America’s Open Technology Institute (OTI) as a senior policy analyst on the secure internet team, where her work addressed free speech, privacy, and transparency online. 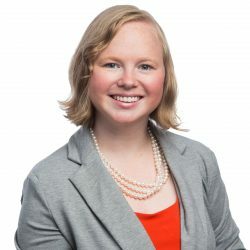 Previously she was a Google Policy Fellow at OTI, interned with the Berkman Center for Internet and Society’s Chilling Effects Clearinghouse (now Lumen Database), and worked with the University of North Carolina-Chapel Hill Center for Media Law and Policy as a blogger and outreach coordinator. She received her M.A. in media studies from Syracuse University’s S.I. Newhouse School of Public Communications and her B.A. from Beloit College in Beloit, Wisconsin. You can find her on Twitter (@lizwoolery).